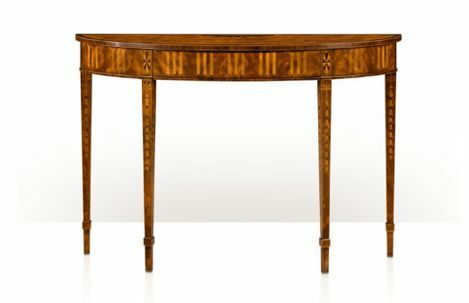 A mahogany, rosewood and parquetry inlaid demi-lune console table, with fan inlaid top, faux fluted frieze and oak lined drawer, on bellflower inlaid square tapering legs. The original George III, Dublin. Attributed to William Moore, circa 1780. From an Irish Private Collection.